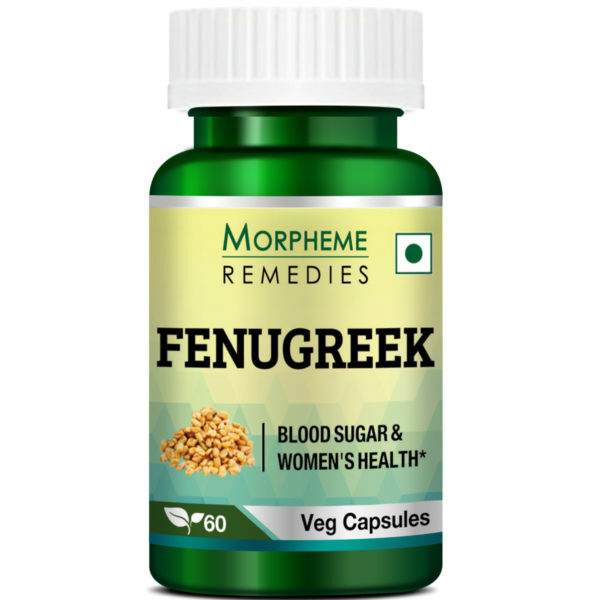 Morpheme Remedies Fenugreek Veg Capsules brings you the health benefits of fenugreek in the form of 60 veg capsules per container. Each capsule contains 500mg of pure fenugreek extract. 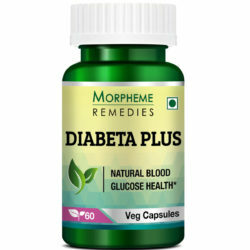 Morpheme Remedies Fenugreek is believed to be a beneficial supplement for diabetics. This product contains no fillers, binders or common allergens. Where Does Fenugreek Extract Come From? 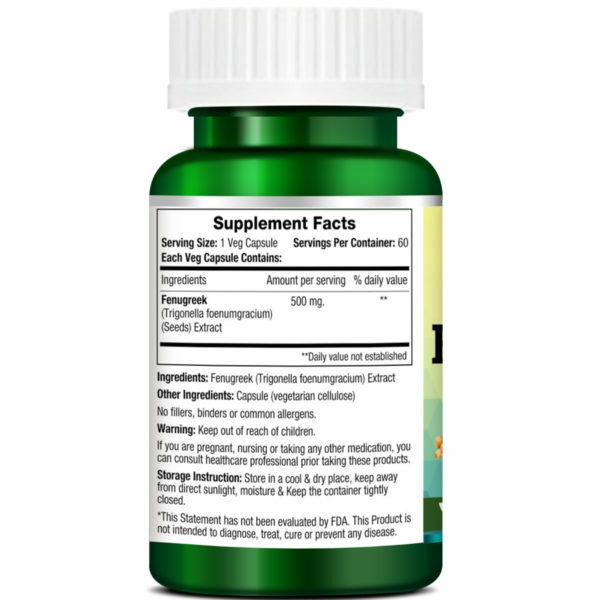 The fenugreek extract in Morpheme Remedies Fenugreek 500mg comes from the seeds of fenugreek plant, which also goes by its botanical name, Trigonella foenum-graecum. This plant is native to India, North Africa, and Mediterranean countries. It can grow up to three feet tall. When in blossom, the plant is lush with leaves and pods. The pods contain yellow-brown aromatic seeds. These seeds are processed in GMP certified facilities to obtain the extract that is the essential ingredient of Morpheme Remedies Fenugreek 500mg. The health benefits of fenugreek come from three best-characterized bioactive compounds in it. They are Diosgenin, 4-Hydroxyisoleucine, and soluble dietary fiber. Blood sugar (or glycemia) is the presence of excess glucose in the blood. Glucose is like a fuel for body cells, but it needs insulin to enter the cells. Lack of insulin causes excess glucose (sugar) in the blood, leading to blood sugar. Fenugreek is scientifically proven to help regulate fasting blood glucose. A meta-analysis of 10 trial studies found that “fenugreek significantly changed blood glucose levels”. The analysis also found that the extracted seed powder from fenugreek “decreased postprandial (after a meal) glucose levels” as well. These studies point towards the efficacy of fenugreek extract against blood sugar or diabetes. Morpheme Remedies Fenugreek 500mg is not recommended for pregnant women. People who are allergic to legumes such as peanuts or chickpeas must seek the advice of a doctor before taking Morpheme Remedies Fenugreek 500mg. Since Morpheme Remedies Fenugreek 500mg may help in lowering blood sugar levels, it should be taken with caution if you are already on diabetes medicine. Patients with serious medical conditions are advised to consult doctors before taking this supplement. My mother told me to take fenugreek when I was breastfeeding my baby. As I can’t tolerate the bitter taste of fenugreek seeds, I started to take this fenugreek supplement. It helped in increasing my breast milk production and kept my baby in good health. 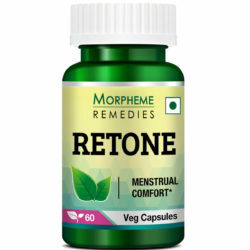 I found it very useful remedy during menopause. I had considerable relief from some of the issues during this important stage. I also notice the cost is quite reasonable. As a strict follower of naturopathy, I think the curative properties of Fenugreek has been wisely used to manage glucose metabolism of the body. I am very much benefited. I always want to have and to maintain healthy glucose metabolism that is why I’m using daily Fenugreek for me to have glucose balance and to maintain over-all health. 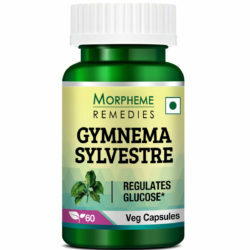 Capsule For Glucose Balance and Womens Health. They are very effective during that uncomfortable menopause. For lactating women, fenugreek is an excellent aid. When I delivered my baby, from the first day I started to take these fenugreek capsules to ensure consistent supply of breast milk. They were wonderful and helped my baby to gain healthy body weight. Seemed to have helped in reducing my blood sugar level. This is a good quality fenugreek seed extract. Fenugreek seed extract is an effective supplement for blood sugar management. I am taking this for over a month. Fenugreek helps in blood sugar management. This fenugreek supplement works well. 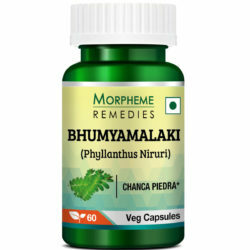 To avoid the bitter taste, it is easy to take fenugreek in this form. I’m taking this supplement for a month. It appears to be effective in controlling blood sugar. Feeling healthier after taking it. These capsules contain good quality fenugreek extract. I’m taking these for blood sugar management and they have helped me. Other Ingredients: Capsule(Vegetarian Capsule),100% Vegetarian. No Fillers, binders or common Allergens. Directions: For best results, take one capsule of Morpheme Remedies Fenugreek 500mg twice daily after meals. The dose can be altered on the advice of a qualified healthcare professional. 1. What is the advantage of taking Morpheme Fenugreek? Morpheme Fenugreek contains the treasured spice of the Mediterranean region. 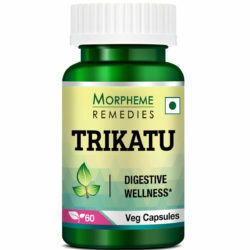 It has 500 mg of fenugreek extract in every capsule, so you need to take only fewer capsules to reach the daily recommended dosage. Several studies have documented the effectiveness of this herb. 2. Is the product safe to take during pregnancy? 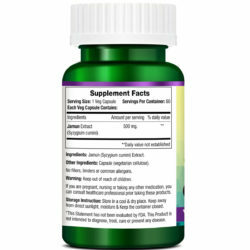 Fenugreek produces uterine contractions, so it is not safe to take the supplement during pregnancy. It is usually recommended as post-natal supplement. 3. Is it safe to consume this product? 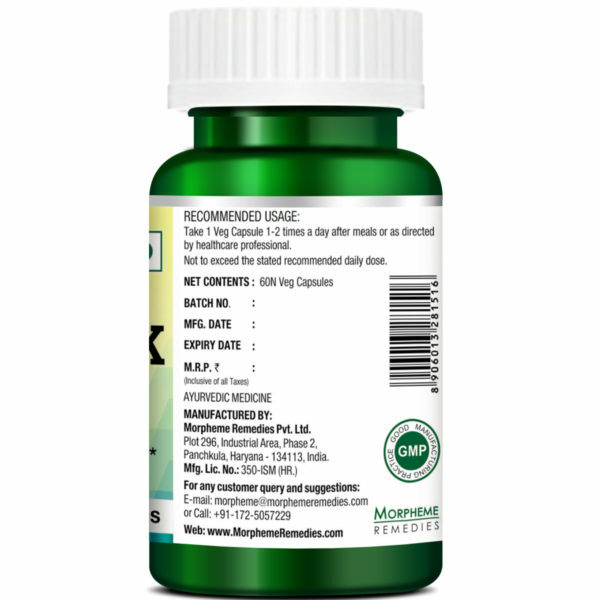 Morpheme Fenugreek is an herbal-based product and is safe to consume. Fenugreek is a legume and hence those who are allergic to legumes such as chickpeas or peanuts must consult your doctor before taking this supplement. Also, fenugreek reduces thyroid and blood glucose levels, so if you are suffering from any medical condition that could have an impact, consult your doctor before taking. 4. What is the dosage? 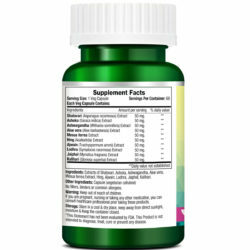 The recommended dosage is two capsules daily twice a day after your meals. 5. Do I need a prescription to take this supplement? No. You do not require any prescription to use this natural herbal supplement. However, it is best to consult your physician, especially if you have any medical history before taking the herbal supplements.